Will Gennady Golovkin Follow Canelo's Lead And Fight at 168 Pounds? Will Gennady Golovkin Follow Canelo’s Lead And Fight at 168 Pounds? The recent news that middleweight king Canelo Alvarez will move up to 168 pounds for his next fight – against reigning “regular” WBA super-middleweight champ Rocky Fielding – caught most everyone by surprise. And, along with the surprise, came the question: will we ever see a third and deciding fight between Canelo and Gennady Golovkin? As fans know, GGG and Canelo are 1-0-1 right now, with most seeing them as 1-1, as the draw from last year was widely viewed as a win for Triple-G. We need that deciding fight. Well, there sure would be one if GGG and Canelo fought at 168. GGG could make that move up, do not rule it out. Even if it is not to get the third fight with Canelo, might GGG move up anyway? There is no word yet on what Golovkin’s plans are for his next fight, his comeback from his first ever pro loss. But there are potentially some good fights up at 168 for GGG. Maybe the former middleweight king will indeed follow Canelo’s lead, and look to win himself a major belt at super-middleweight. Promoter Bob Arum has, for quite a while, wanted to see GGG step in there with his fighter Gilberto Ramirez, the unbeaten, reigning WBO champ at the weight; and Ramirez has again called out Golovkin. 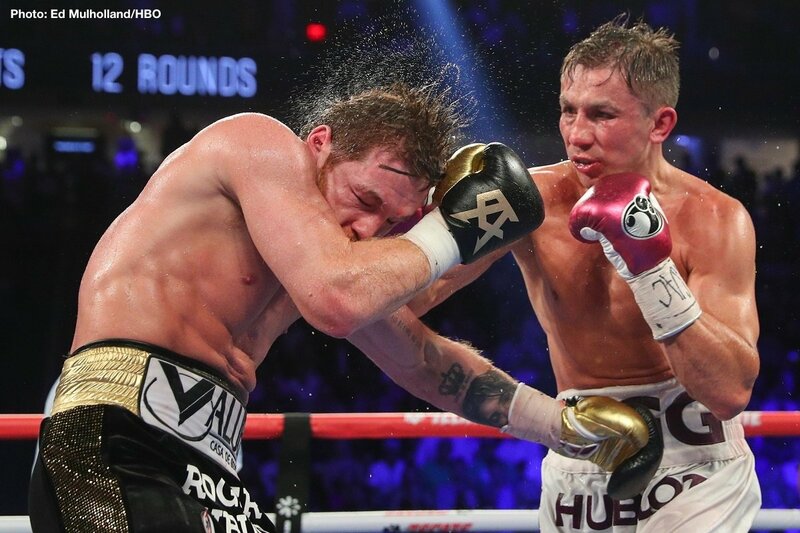 True, neither this fight nor any other world title fight at 168 is as mouth-watering as that third clash between GGG and Canelo, but it would be interesting seeing whether or not Golovkin could indeed become a two-weight world champ. Golovkin does seem to be a natural 160 pounder (as was the case with the great Marvin Hagler, who never budged a pound in his life), but just maybe the 37 year old – who may perhaps need a fresh approach in his next campaign – will look to add another world title to his resume. Maybe. You are here: Home / Boxing News / Will Gennady Golovkin Follow Canelo’s Lead And Fight at 168 Pounds?